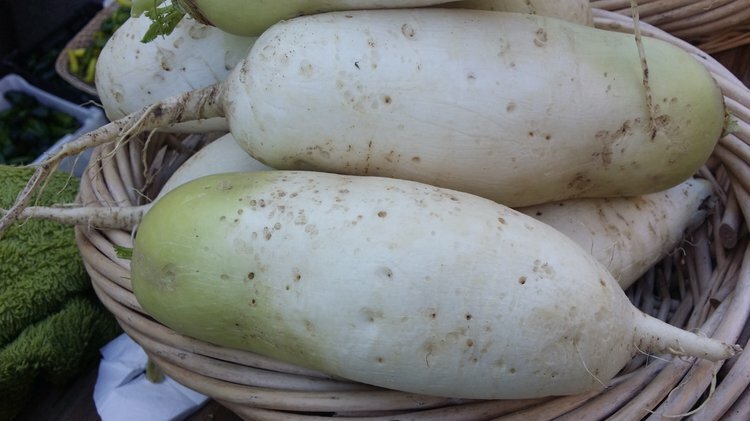 Daikon is a mild-flavored winter radish (Raphanus sativus) usually characterized by fast-growing leaves and a long white napiform root. Daikon is native from the Southeast or continental East Asia and is harvested and consumed throughout the region, as well as South Asia. Daikon is a mild-flavored winter radish (Raphanus sativus) usually characterized by fast-growing leaves and a long white napiform root. Daikon is native from the Southeast or continental East Asia and is harvested and consumed throughout the region, as well as South Asia. The root is now primarily grown in North America to prevent soil compaction that can make soils become less able to absorb rainfall. Here are the 7 health benefits of daikon. Daikon is very filling and satisfies hunger without increasing the calorie count. One root (338 grams) of daikon contains only 61 calories. This low-calorie nutritionally dense food is perfect for weight loss. 2. Daikon can help you manage your type 2 diabetes. Daikon is slowly absorbed into the bloodstream, which prevents sugar crashes, sugar cravings, and mood swings. Those with type 2 diabetes may find daikon as suitable food that will not increase their blood sugar levels. 3. Daikon can help provide a healthy digestive system. The fiber content in daikon helps induce regularity in bowel movements and alleviate symptoms of constipation. One daikon root contains 5 grams of dietary fiber. The daily recommended dietary fiber intake for men and women are 38 grams and 25 grams, respectively. Daikon is high in potassium and low in sodium, which can contribute to reducing the risk of hypertension. This ratio has been positively correlated with reduced blood pressure because when it interacts with the arterial supply of vascular beds, relaxes the blood vessels, and increases blood flow. One daikon root contains 767 milligrams of potassium and only 71 milligrams of sodium. 5. Daikon can help you reduce the risk of cancer. Daikon is an excellent source of vitamin C. One cup of daikon can give 124 percent of the daily requirement of vitamin C. This acts as an antioxidant to remove toxins from the body and detoxifies it. Vitamin C can destroy free radicals that turn healthy cells into cancerous cells. 6. Daikon can help the body create new healthy red blood cells. Copper and iron are crucial for the new blood cell formation. One cup of daikon contains 8 percent and 19 percent of the recommended value of iron and copper, respectively. A deficiency of iron can lead to anemia. 7. Daikon can improve your nervous system’s health and help prevent diseases. Some vitamins like folate play a critical in the regulation of specific amino acids that the nervous system requires. One daikon root contains 24 percent of the daily recommended value of folate. Studies have shown that a deficient amount of dietary folate can increase the homocysteine levels, which can be a dangerous precursor to neurodegenerative diseases like Alzheimer’s disease and Parkinson’s disease. Also, folate assists in neural tube formation and red blood cell formation in prenatal babies. A deficiency of folic acid in pregnant women can lead to the birth of underweight infants and may also result in neural tube defects in newborns. Yun, J., Kavalier, A., Roper, J., Gross, S., Rago, C., Papadopoulos, N., ... & Cantley, L. (2013). Abstract C60: Vitamin C inhibits the survival and growth of colorectal cancer cells with KRAS or BRAF mutations. Park, S. (2013). The effects of high concentrations of vitamin C on cancer cells. Nutrients, 5(9), 3496-3505. Harris, H. R., Orsini, N., & Wolk, A. (2014). Vitamin C and survival among women with breast cancer: a meta-analysis. European journal of cancer, 50(7), 1223-1231. Shen, L., & Ji, H. F. (2015). Associations between homocysteine, folic acid, vitamin B12 and Alzheimer’s disease: Insights from meta-analyses. Journal of Alzheimer's Disease, 46(3), 777-790. Reynolds, E. H. (2014). The neurology of folic acid deficiency. Handbook of clinical neurology, 120, 927-943.